Portfolio to Go for the iPad is a great tool for photographer’s to share access to their Flickr photostream with those around them on the beautiful iPad screen. 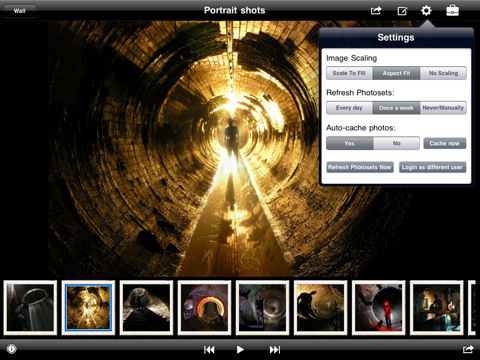 In a no-frills, easy-to-use manner, the app utilizes the full screen to show a scrollable list of the user’s photosets. Within this initial view you can scroll vertically to browse all the available photosets, as well as horizontally by flicking your finger on any of the photoset rows. Clicking any of the thumbnails in the photoset list takes you to a larger view of that photo with the list of thumbnails below. Clicking the photo again enlarges it for an even better, un-cluttered view of the photo. As you can imagine, viewing many photos at a glance from Flickr could be a slow and tedious operation as all the thumbnails and larger graphics have to download live over the Internet. Thankfully, Portfolio to Go will automatically cache them after it has downloaded each one. This makes the experience much smoother when viewing photosets again. It additionally makes it smoother as you are browsing since the next photo is likely to already be loaded, mitigating the need to wait for it to download when you view the photo. Within the photoset detail view, you can opt to have the photos play in a simple slideshow where every few seconds, it advances to the next photo in a sliding fashion. 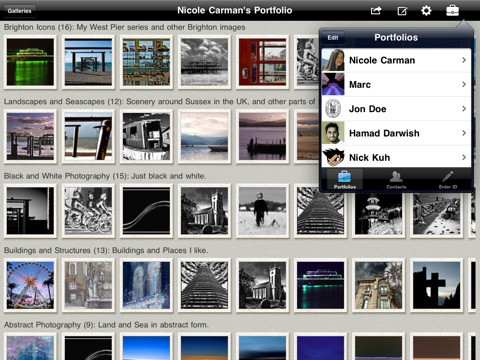 Portfolio to Go for the iPad also allows you to see your friend’s photostreams in the same way you would view your own. The app offers a few other customizations such as image scaling, where you can choose to show the photos by scaling to fill the screen, fit them based on their aspect ratio, or no scaling at all. This leads me into a couple of features that I feel are missing from the application. One of which is when I’m viewing a photo in the large view, I cannot zoom in or out. This is an expected interaction as so many applications for iOS devices enable it. This becomes particularly an issue if you choose to show the photos to fill the screen or no scaling as you cannot zoom out to see the full photo or pan it—you can only slide it left or right which takes you to the next or previous photos. Another performance issue I see with the application is when you are on the photoset list view and the user has many sets, the vertical scrolling is choppy. The horizontal scrolling of the photosets in this view is liquid smooth, however. It is also worthy to note that the app has a neat feature that allows you to send any selection of your photosets to a client that they can view on a companion application called Portfolio to Go Player. The nice part about this is is you are not emailing full photos, in fact you are just emailing them a link to online content that will be displayed in the player. Upon initial review of this application, I encountered a couple of issues which caused the app to crash consistently. Within the app, the author (Nick Kuh), provides a link to suggest additional features which are sent to his email. I reached out to him in regards to the crashes I was encountering and he was very interested in fixing them quickly. I later received an email that he had fixed the problems and asked me to try the app again. Nick is clearly interested in creating a great product. All in all, I think the Portfolio to Go for the iPad is great and would be even better with some fine-tuning of the graphics performance. Other than that, it’s a perfect no-frills offering of a portfolio client for Flickr. AppSafari review of Portfolio to Go for Flickr was written by Kyle Hayes on October 13th, 2010 and categorized under App Store, iPad apps, Photos, Social. Page viewed 4193 times, 1 so far today. Need help on using these apps? Please read the Help Page.